ID theorists draw exclusively upon empirical evidence to support the existence of a creative intelligence or designer. ID purports that design can be detected without any understanding of who the designer is or why the agent acted, or even how the phenomenon in question was actually produced. ID is a unique scientific position that stands in stark contrast to naturalistic, materialistic philosophy of science which puts forth abiogenesis rather then intelligent agents as the main mechanism that created biological systems for sustaining life. It can also clearly be distinguished from religious creationism in that it stakes no claim regarding the specific identity of the creator, nor does it use references from scripture when forming theories about the history of the world. In fact, many ID theorists support the idea of common descent and billions of years of time. ID simply postulates that certain features within the cosmos present clear evidence of being deliberately and intelligently designed. Example of intelligent design in nature are based on analogy, a common scientific procedure. It is argued, for example, that if biological components are analogous to those produced by intelligent agents, then an intelligence is the most reasonable cause. ID proponentw generally infer that all complex biological systems are generated by intelligent agents. This aspect of intelligent design is also an integral part of the creation model put forth by theists. As such, creationists are encouraged to study the evidence and examples of design that are illustrated by ID advocates. This unique scientific thinking allows for the development of independent models of design for Christians, Jews, Muslims, or any other religious group which proposes such a process for life. By taking this position, intelligent design has been welcomed in some government schools and in industries that normally hold prejudices against religious creationism. For example, the ID documentary titled Unlocking the Mystery of Life has been shown on PBS television in several states in the USA. Key concepts of ID include irreducible complexity, specified complexity, and a fine-tuned universe. Irreducible complexity is a concept popularized by Lehigh University biochemist Michael Behe in his 1996 book Darwin's Black Box, which supports what is known as intelligent design theory. If something is irreducibly complex, then it can not be reduced to less complex functions, and therefore, could not develop by assembling preexisting components. Intelligent design theorists argue that while some systems and organs can be explained by evolution, those that are irreducibly complex cannot, but instead an intelligent designer must be responsible. The Intelligent Design concept of specified complexity was developed by mathematician and philosopher William Dembski. Dembski claims that when something exhibits specified complexity (i.e., is both complex and specified, simultaneously) one can infer that it was produced by an intelligent cause (i.e., that it was designed), rather than being the result of natural processes (see naturalism). He provides the following examples: "A single letter of the alphabet is specified without being complex. A long sentence of random letters is complex without being specified. A Shakespearean sonnet is both complex and specified." He states that details of living things can be similarly characterized, especially the "patterns" of molecular sequences in functional biological molecules such as DNA. The anthropic principle is used to develop scientific explanations in cosmology. It originated from observations that the earth uniquely and perfectly meets the requirements for life, and more specifically human life. Anthropic comes from the Greek word ἄνθρωπος, anthrōpos ("Man"). It is often set up as being in opposition to the Copernican Principle. The very presence of life within the universe is reliant upon a large number of extremely improbable events, and even the slightest alteration would make it impossible for life to exist. Everything from the particular energy state of the electron to the exact level of the weak nuclear force seems to be tailored for us to exist. We appear to live in a universe dependent on several independent variables where only a slight change would render it inhospitable for any form of life. And yet, here we are. Proponents of intelligent design draw support from this fact because it strongly suggests that the cosmos has been specifically designed. Intelligent design (ID) can be used as a scientific tool to deduce whether a system's components are the product of chance, natural law, intelligent design, or some combination. A research program usually begins by observing the types of information produced by intelligent agents, and then attempting to find objects in nature which have the same types of properties. Intelligent design has applied these scientific methods to detect design in irreducibly complex biological structures, the complex and specified information (CSI) content in DNA, the life-sustaining physical architecture of the universe, and the geologically rapid origin of biological diversity in the fossil record. ID research methodology follows the same basic process used by all scientists, which generally includes observations, hypothesis, experiments, and conclusion. The ID researcher typically begins with an observation that intelligent agents produce a specific type of CSI. It is then logically hypothesized that if natural objects are designed, they will also possess significantly high levels of this or other types of CSI. The scientist will then conduct experiments to test if they contain CSI. Irreducible complexity (IC), as defined by Michael Behe, is one easily testable form of complex and specified information. The process used to detect IC in biological systems is known as reverse engineering, which is historically an architectural/engineering/structural method of studying man-made machines and structures. Reverse engineering is particularly useful in detecting IC in molecular biology systems. This is because the living cell is filled with molecular machines that perform various purposeful tasks. At the same time, these biomachines are made of amino acids and proteins, which are derived by direct production from the informational code in the DNA. This yields the cell, its individual parts, and the internal means of production, highly investigable. By using reverse engineering, structures can be examined to see if they require all of their parts to function. When ID researchers find irreducible complexity in biological systems, they conclude that such structures were designed. The term Intelligent design often refers to what is called Restricted Intelligent Design to distinguish it from General Intelligent Design as outlined by Robert A. Herrmann. Restricted Intelligent Design is what is generally referred to by the term "intelligent design." It is used to distinguish it from the broader concept known as General Intelligent Design developed by Robert Herrmann. Restricted Intelligent Design deals mainly with biology, where it seeks to identify specific evidences of design. Restricted Intelligent Design studies design only by comparing it to human design, making it a poor model for dealing with a higher intelligence such as God. The General Intelligent Design Model (GID-model or simply GID) is an interpretation of the General Grand Unification Model (GGU-model) - a mathematical model - constructed by Dr. Robert A. Herrmann. The research started in August 1979 and the modern mathematical theory used for the modeling processes is obtained via nonstandard analysis. Unlike Restricted Intelligent Design which studies design and intelligence is only inferred by comparison with a few human designs, the GID-model defines intelligence and shows, by direct evidence, that each physical process and each physical result produced by each process is intelligently designed. 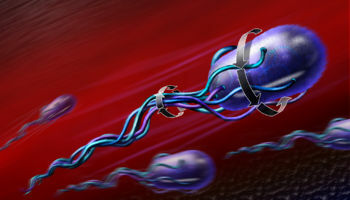 Molecular machines, such as the flagellum is a common example used to demonstrate the mechanisms in nature that illustrate intelligent design because it is irreducibly complex. The flagellum is a molecular motor used by microscopic organisms, such as bacteria and protozoans, to propel themselves through an aqueous medium. Bombardier beetles belong to the Family of beetles commonly referred to as Ground Beetles. Patterns in a Sunflower can be described mathematically as a Fibonacci sequence. The fibonacci numbers are a sequence that is described by their mathematical relationship. The sequence of numbers can be found displayed in many organisms, such as the spiral patterns in the heads of sunflowers. God has arranged sunflower seeds without gaps in the most efficient way by forming two spirals. ID predicts that the Universe had a beginning. ID predicts an increase (and not a decrease), as science progresses, in the number of finely-tuned parameters pertinent to the laws and constants of physics. ID predicts the presence of specified complexity in living systems. ID predicts that, as scientific research progresses, biological complexity will be seen to increase over time, and information will have a more and more central role in the governing of life’s operations. ID predicts an increase in evidence for the non-adequacy of the DNA-centric view of living systems. ID predicts that complex molecular convergence will happen routinely. ID predicts the presence of irreducible complexity with respect to macromolecular systems and organelles. ID predicts that the prevalence of functional protein folds with respect to combinatorial sequence space will be extremely small. ID predicts that evolutionary pathways to new protein functions will require multiple co-ordinated non-adaptive mutations (more so than likely to be achieved by a random process). ID predicts that DNA, which was once considered to be junk, will turn out to be functional after all. ID predicts delicate optimisation and fine-tuning with respect to many features associated with biological systems. ID predicts that organisms will exhibit in-built systems which promote evolvability (e.g. front loading). ID predicts the observed pattern of the fossil record whereby morphological disparity precedes diversity. ID predicts saltational, or abrupt, appearance of new life forms without transitional precursors. The Intelligent design movement has been furthered significantly by several organizations, most notably the Discovery Institute and Access Research Network. ↑ 1.0 1.1 1.2 1.3 The Theory of Intelligent Design: A Briefing Packet for Educators p6. by Discovery Institute. November, 2007. Design Argument by the The Dictionary of the History of Ideas. University of Virginia. The Facts about Intelligent Design: A Response to the National Academy of Sciences’ Science, Evolution, and Creationism by Casey Luskin. January 16, 2008. Another Way to Detect Design, Response to review of "The Design Inference" by Dembski, William A. Science Declares Our Universe IS Intelligently Designed by Robert A. Herrmann Ph. D.
The living cell an extract supporting design in nature from "Creation, Evolution and Science." - by John V. Collyer. The Scientific Existence of a Higher Intelligence by Robert A. Herrmann, Ph.D.
Key figures of Intelligent Design interviewed by David Boze Douglas Axe, Guillermo Gonzalez, David Berlinski and Casey Luskin discuss the current state of Intelligent Design. Evolution News & Views. December 14, 2011. Michael Denton on the Collapse of the Darwinian Paradigm and the Coming Revolution Video interview with evolutionist Michael Denton. Evolution News and Views, July 3, 2011. Evolutionary biochemist claims to have proved common descent. Actually, Douglas Theobald has shown that one common ancestor is more likely than many—after assuming abiogenesis, which his analysis does not treat. What he actually has shown is that all of life follows common design principles. Creationism examiner. May 13, 2010. 2009 Daniel of the Year Stephen C. Meyer, director of the Discovery Institute's Center for Science and Culture, is awarded World Magazine's prestigious honor for his fight to show that all lives have eternal value because they are the work of a Creator and not the product of chance. World Magazine Vol. 24, No. 25. December 19, 2009.